SLCC community has benefited greatly over the years from the efforts and support of Pam Perlich and Ashok Joshi. Community colleges, at their best, are much more nimble as far as being able to develop and implement creative programing adapted to new student bodies and their situations. Ashok Joshi and Pam Perlich have been chosen to receive honorary doctorates as part of Salt Lake Community College’s 2018 commencement ceremonies on May 4. What began in India, spilled over into Joshi’s involvement locally with colleges and their students, who he still mentors today on an individual basis. He has funded trips for students to India to help out in schools and villages, including with women for whom he helped start small businesses with microloans. A past Salt Lake Community College Trustee, Joshi now considers himself retired, though recently he was executive director of Technology Holding LLC. Known as a serial entrepreneur, he has ten ventures under his belt and 137 patents, mostly in the electrochemical area, that bear his name. 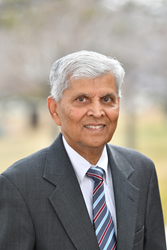 Joshi received his undergraduate engineering degree in India, which he left in 1967 and soon followed with master’s and doctorate degrees in material science from Northwestern University in Illinois. One of his greatest professional accomplishments in a long career was receiving the Industrial Research Institute Achievement Award in 2009 for exceptional work as an entrepreneur, scientist and philanthropist in the research and development industry. Perlich started her career teaching at what is now Tulsa Community College for seven years before traveling for a year and then moving from her home state of Oklahoma to the Beehive State in pursuit of her PhD in economics at the University of Utah. “The fact that it is the community college makes it so meaningful for me,” she said about the honor from SLCC. “And I so respect and admire (SLCC) President Huftalin’s leadership, vision, passion and effectiveness, her commitment to diverse populations and inclusion, which is a core piece of my work.” Perlich is currently Director of Demographic Research at the Kem C. Gardner Institute for the University of Utah, having previously taught economics at the U of U and Westminster College. Perlich also held the post of research economist for the Utah Governor’s Office of Planning and Budget from 1993 to 2000. Her job as a demographic researcher then and now has far-reaching impacts throughout Utah in government, education, business and beyond.